Apartments Silvija town of Primosten price per day from € 39 Please inform Apartments Silvija in advance of your expected arrival time. You can use the Special Requests box when booking, or contact the property directly with the contact details provided in your confirmation. Apartment, 50 square meters, close to the beach town of Primosten During your visit to Croatia, don't forget to visit the city of Primosten, which will surprise you with its numerous cultural and historical attractions. While there, book this perfect accommodation that overlooks the city and beautiful Adriatic Sea and relax in its comfortable rooms equipped with all necessary amenities. Entertainment and Outdoor activities: TV, Satellite television. Distance to the beach: 100m. Distance to the golf club: 20km. Distance to the restaurant: 100m. Distance to the bar: 100m. Apartments Toni town of Primosten price per day from € 65 Positioned along a private beach, Apartments Toni presents self-catering accommodation with a private balcony looking out over the Mediterranean Sea. Gratis wireless internet access is available in all areas. The modern, air-cooled apartments come with an open-plan lounge area with a lcd tv. They also include a dining table and a fully-equipped kitchen with dishwashing machine. 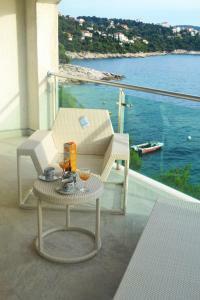 Apartments Toni is set just 5 minutes' drive from the sandy shores of Primošten Beach. Peaceful apartment, great guest reviews, close to the sea town of Primosten Small but comfortable apartment in Primosten, situated 120m away from the beach is totally equipped and has a private parking. Distance to the ferryboat: 63km. Distance to the golf club: 3km. Distance to the beach: 120m. Distance to the restaurant: 200m. Entertainment and Outdoor activities: TV, Satellite television. Vila Bilo town of Primosten Vila Bilo is set on the beautiful Adriatic coastline in Bilo, 4 km from Primosten. It presents air-cooled apartments with satellite television. 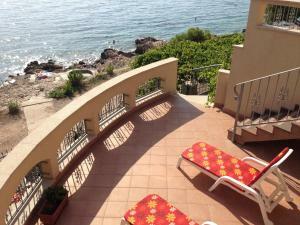 All the apartments have terraces with magnificent views over the sea and the cove. There is a sizable free car parking area available and you can use Vila Bilo's gym and sit back at the lounge bar. Accommodation, max 6 persons town of Primosten Completely furnished interiors situated on the great location are just one of the reasons why you should book this quality villa in Primosten. Entertainment and Sport: TV, Satellite television. General details: air conditioner, garage. Accommodation, max 8 persons, Primosten, Croatia town of Primosten This spacious villa is situated in the residential area of Primosten and in its brightly colored rooms can offer you everything you need during your stay in this attractive city. Entertainment and Sport: TV, Satellite television. General details: air conditioner, garage. Air-conditioned accommodation, max 8 persons town of Primosten In a picturesque environment of the well known summer resort Primosten, is located this private accommodation, bordered by greenery and with the top interior design to provide you with the calmness and tranquility needed for a family vacations in Croatia. Kitchen information: freezer, oven, microwave, coffee maker, toaster. Entertainment and Outdoor activities: TV, Satellite television. Air-conditioned accommodation, max 4 persons, Primosten town of Primosten Nicely decorated, comfy and fully equipped villa is positioned in Primosten. Enjoy a stroll around the city whose attractions will delight you. General details: air conditioner, parking, garage. Entertainment and Sport: TV, Satellite television. Apartment Mikelin town of Primosten price per day from € 40 Apartment Mikelin. Entertainment and Outdoor adventures: TV, Satellite tv. Rooms Tepli Bok town of Primosten price per day from € 67 Situated right above the sea and featuring a private swimming pool, Rooms Tepli Bok presents free internet access and a covered outdoors terrace where morning meal is served. Visitors advantage from 2 free loungers and a parasol for use on the private beach under the property. A balcony looking out over the sea and a toilet with shower are provided in all rooms at the Tepli Bok. The private beach is accessed by a 20-metre long staircase. Free car parking is provided on site. There is a tourist agency providing various trips just 50 metres away, while the closest grocery shop is 500 metres from the house. The centre of Primošten is approximately 1.5 kilometers away. Villa Favola town of Primosten Vacation home Favola is a detached villa with an outdoors terrace, set in Primošten. Gratis wireless internet is available throughout the property. 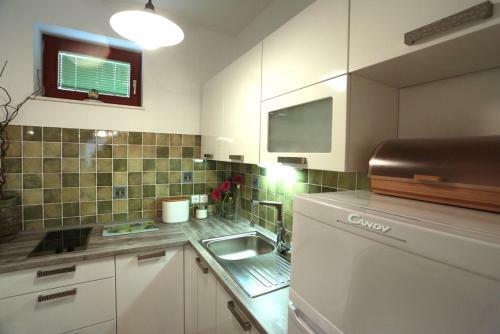 There is a seating area, a dining area and a kitchen complete with a dishwashing machine and an oven. A TV with satellite channels is featured. There is a private toilet with a bidet. Split is 43 km from Villa Favola, while Trogir is 28 km from the property. The closest flight terminal is Split Airport, 31 km from the property. There are many wonderful tourist attractions to see in Primosten and great accommodation options, from hotels to apartments. The subtropical flora, warm southern climate, beautiful beaches and bays, and high-quality accommodation in private facilities will certainly make your stay in Primosten unforgettable. Book one of our authentic apartments from our offer in Primosten and enjoy the spirit and uniqueness of the Mediterranean. Primosten, Croatia is one of the best-known tourist resorts in Dalmatia, and one of the most scenic little towns on the Adriatic, with numerous distinct narrow streets in the old town core, on the hilly peninsula. It has over 4000-bed units in villas and private apartments. There is a wide selection of excursions since it is only 30 kilometers from two national parks: Krka and Kornati. Besides the beautiful beaches, there are also nudist beaches in the resort and near the hotel on the island of Smokvica. Sitting on at the edge of the Adriatic Sea, this small town in Dalmatia is ideal for blending sightseeing and the sunshine. Travelers have been admiring the thrills of Dalmatian loveliness Trogir and Dubrovnik for many years now, Primosten, in northern Dalmatia, has remained rather off the vacation radar. And although Primosten is probably not as evidently appealing as Dubrovnik, and maybe not as fashionable as Trogir, the town undoubtedly has its own charms. Parish Church of St. Juraj was constructed in the 15th century and was completely rebuilt in the 18th century. Church of the Lady of Mercy from 1553. Church of St. Roko from 1680. Parade during the feast days of Our Lady of Loret (held in May). Famous Aurora nightclub in Primosten. Attractive pebble beach on the Raduca peninsula. Nature has provided the southern side of the peninsula a rocky and northern side pebbly beach. Raduca beach has been awarded the Blue Flag award that certifies well-kept and secure surrounding and many facilities. Nudist beach on the island of Smokvica. Beaches in the coves Primosten, Vela and Mala Raduca and Peles. From at some point a fisherman's village Primosten has established to notable traveler place. 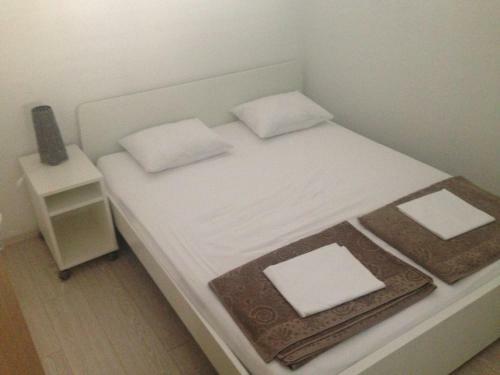 You can find accommodation in hotels and resorts and private apartments; also, there are many taverns, café bars where you can experience the healthy and balanced Mediterranean food with well-known red wine Babic Stone residences, chapels, and slim streets are ideal harmonies of past and existing time. Despite heritage and reaches of modern-day civilization, Primosten has even these days maintained its ambiance and architectural evidence of medieval Mediterranean fishermen's town. Sights of wine stone cells on the closest hills are so special attraction that its photos have found the place even in the facility of United Nations in New York as centuries-old proof that man's arm can engraft even the most roughness surroundings. Campers can discover in Primosten their own place. Alongside numerous private auto-camps, 3 km from Primosten there is an auto-camp "Adriatic" with modern services and facilities for this type of vacation. Camp perfect goes with the natural background of cultivated pine forest. The camping area is 80 % covered by dense pine forest and the remaining sections are arrayed by holly oak and olive plants. Use our Primosten accommodation list to make reservations online. Most ideal time to take a trip to Primosten is summer season. Before anything else, there are great deals of inexpensive airline flights flying into Zadar and Split airport terminal. Second, there are numbers of activities and events taking place in Primosten in the course of the summer season. 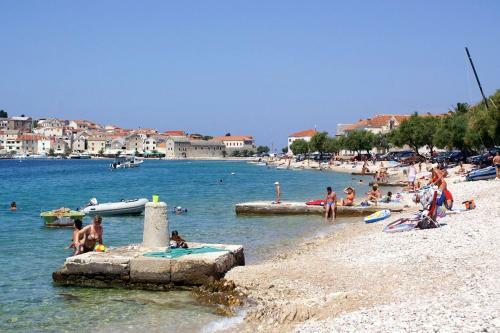 Third, tons of beaches around Primosten, hundreds of tiny and large islands are waiting to be explored. Primosten has a moderate weather condition and the climate is usually fine all over the year, despite the fact that winter times can be rather unstable. Summers months are warm, with temperature levels in the mid-thirties, and all those looking for milder temperature levels may choose the months of June and September. The lower season temperatures are certainly more favorable to sporting activities, for example, climbing and biking. Thoughts and opinions on the dates of top season differ, but I would certainly place them somewhere between June 15 and September 15, with July and August the busiest. It is the time of year when everything takes place and the town of Primosten is crowded. Eventually, the selection of when to head to comes down to individual choices, however, something is ensured - Primosten is a remarkable place to be, no matter what the month.